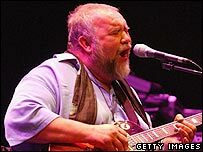 Singer-songwriter John Martyn has been given the lifetime achievement award at this year's BBC Radio 2 Folk Awards. The Scotsman, who has been working for more than 40 years, was presented the award by his friend Phil Collins. And in a special message, Eric Clapton described Martyn as: "So far ahead of everything, it's almost inconceivable." Other winners included Andy Cutting, who won musician of the year, and Julie Fowlis, who was named singer of the year. Actor Sean Bean presented duo of the year award to John Tams and Barry Coope. Lau were named best group, while Bellowhead won best live act for the second year running. Shirley Collins picked up the honour for exceptional contribution to folk music and Rachel Unthank won the Horizon Award for best emerging artist. The ninth annual BBC Radio 2 Folk Awards were held at The Brewery in London and hosted by the station's Mike Harding. He said: "We celebrate another year of great music with well-deserved awards for exciting young traditionalists like Rachel Unthank and established, world-class musicians like John Martyn and Shirley Collins." Highlights can be heard on BBC Radio 2 on Wednesday at 1900 GMT.